10th class for applying this RRC Southern Railway Safaiwala Jobs. Online applications online accepted for these Safaiwala jobs of RRC Chennai recruitment 2018. 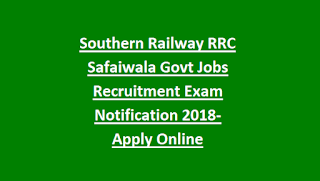 Official website to apply online for this Southern Railway Safaiwala jobs is rrcmas.in. 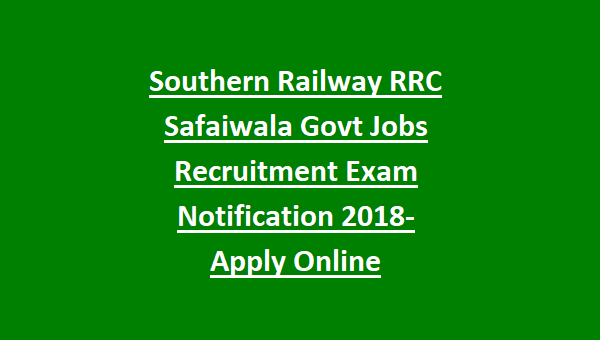 Last date to apply online for this Southern Railway Safaiwala jobs is 27-08-2018. Candidates selection for this Southern Railway Safaiwala jobs is on basis of written exam and physical tests. More information about this RRC Chennai Safaiwala jobs exam pattern and syllabus, how to apply online, Physical Test Details and other details are given below. Last Date to apply online for this RRB Chennai Safaiwala Post is 27-08-2018. There are total 257 posts in this REC Chennai recruitment. As on 01-01-2019 candidates age limits are 18-33 years. For SC/ST-upper age limit is 38 years. For OBC NCL upper age limit is 35 years. 10th pass candidates are eligible to apply online for this RRB Chennai Safaiwala jobs. Candidates selection will be based on Screening Test marks and physical tests. Written exam will be conducted for 50 marks. Exam will be objective mode only. Exam paper will be given in Tamil, Malayalam, English and Hindi languages. Exam syllabus will be 10th standard only. Like Group D Posts Syllabus is applicable. Written exam qualified candidates will be called for Physical tests (PET) based on merit in written exam in 1:4 ratio. Physical Test consist of 35 kgs weight lifting and clear the distance of 100 meters in 2 minutes with that weight without putting it down. For female candidates 20 kgs of weight and distance and time is same as above. For UR/OBC candidates exam fee is Rs.500/-. For SC/ST/PWD/Women candidates Exam fee is Rs.250/-. Candidates who are interested they can apply online for this RRB Chennai Safaiwala posts on or before 27-08-2018 through the official website of www.rrcmas.in. Admit card release date, exam date, exam result date, exam syllabus and other related information is given in this website only.